Enjoy water views of the Mystic River. Relax on the front porch and watch the boats go by. You will literally be steps away from some of the best restaurants and attractions in downtown Mystic. Fully furnished apartment with everything you need to feel right at home. This rental includes use of one off-street parking space in the marina parking lot directly across the street. This apartment is located next door to two other very similar vacation rentals. Details available by entering the following listing IDs in the search field: 484513, 746442. 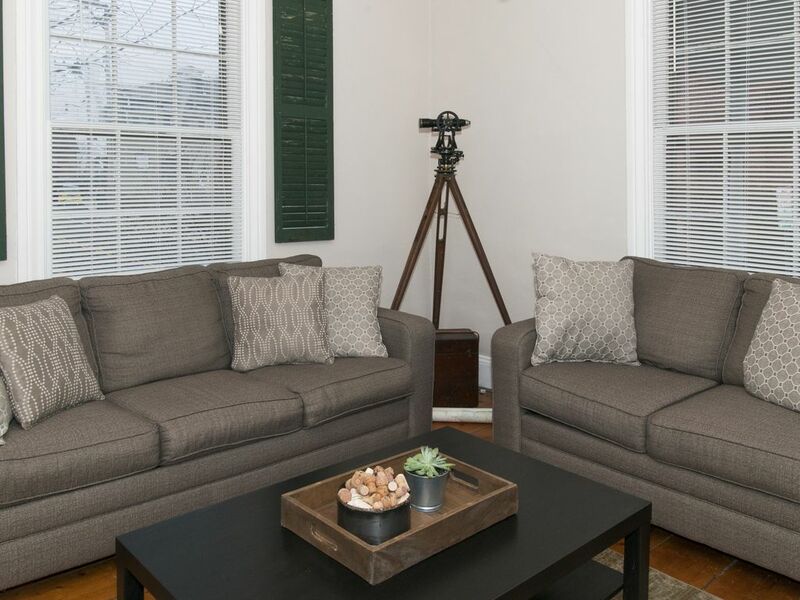 This property is set up to comfortably accommodate up to 6 guests. Each of the two bedrooms feature one queen-sized bed with super comfortable memory foam mattress and the living room includes a sleeper sofa with a full sized memory foam mattress as well. Clean linens are provided based on the number of guests indicated in your reservation. When you are not dining out at the local restaurants, take advantage of the full-sized kitchen to prepare your own meals. You will be provided with plenty of towels for up to 6 guests. The bathroom is located on the second floor and features a full-size, antique clawfoot tub with a new dual shower head. This home was built in 1845. It has had a lot of updates all new furniture, is amazingly located and is fully functional but still has some historic home quirks. We call it character! -The floors slope towards the center of the house a few degrees due to 170+ years of settling, but are safe and stable. -The stairs leading upstairs to the bathroom and bedrooms are original to the house and a little steep by today's standards. Please keep this in mind if you have small children or if anyone in your party has mobility issues. -When flushing the toilet, you may hear the air intake valve located behind the tub vibrating. It's just a one-way air admittance valve allowing air to enter the drain system and nothing to worry about. -The inside of the antique claw foot tub has a few spots of discoloration in the enamel coating. We assure you it is not actually "dirty", and the tub is fully cleaned, scrubbed and sanitized with bleach before each stay. -The outlet in the bathroom is only a 2-prong outlet so if you need to use a blow dryer, the bedrooms have suitable 3-prong outlets and full-length mirrors behind the doors. -Some of the lights in the house operate by pull-chain or a switch directly on the wall sconce. I was born in Denver, CO, but grew up in and around Mystic, CT. I spent over 6 years as an IT consultant in the pharmaceutical industry before switching to real estate. I'm a licensed agent, general contractor, landlord and hospitality manager (operating my vacation rental properties). I enjoy traveling, fixing up old houses and spending as much time outdoors and on the water as possible. This apartment is located in a house right next door to another house me and my parents and I partnered up on to fix up in 2012 (VRBO listing #484513). When this property came up for sale by the out-of-state owner, I jumped at the opportunity to purchase and fix it up in order to share it with fellow travelers. The views of the Mystic River from the front porch and the close vicinity to downtown Mystic restaurants and attractions make this rental an ideal place for a weekend getaway or an extended vacation. Dedicated off-street parking and easy access to the Mystic Amtrak station and I-95 make traveling to and from the location a breeze. Once you're parked you can easily walk everywhere in Downtown Mystic! The bathroom is located on the second floor of the apartment. One off-street parking space included. Located directly across the street in the marina parking lot. Additional street parking available in the surrounding area. Great stay at Kevin’s property. We had a wonderful time in Mystic. The apartment was a great home base—clean, comfortable beds, adequately stocked kitchen, and a superb location. Not only centrally located and short walk to all restaurants and shops in mystic, but close to other great towns in Connecticut and Rhode Island. If you’re looking for a simple, no frills (and quirky) place in mystic, this is perfect for a weekend trip. Would stay again! Quaint, clean, and great location. Reasonably priced too. Owner very nice to work with. Fantastic location. A few steps from the main street. Went to Mystic for the first time and absolutely loved the location of this property. Bedrooms are large and living area downstairs is great. We walked all around downtown Mystic which is amazing. Also took a short jaunt down the road to go to the Mystic Aquarium which was awesome. I will definitely stay here again when I return to Mystic. Owner is very responsive if you have any issues. We stayed for a quick New Year's Eve getaway for 6 adults. This place lived up to its description- close to walk to everything in the town of Mystic! Immaculately clean and very well decorated, the house had a lot of character that we felt added to our stay. Loved the claw foot tub and the very high ceilings downstairs and big windows that made the whole place feel light and airy. Kevin was very thorough in the details for the listing, really easy self check-in/out, and he responded very quickly to any messages. Sofa bed was a good memory foam mattress but a sofa bed nonetheless, so if staying for a prolonged period it would probably be best for just 4 adults. Really enjoyed it and hope to return! Excellent location and lovely house! My husband and I came to Mystic for Thanksgiving and we could not have asked for a better property to stay in. The house is absolutely charming and well stocked. The beds are comfortable and Kevin was very attentive. Check in and out was very simple. It is steps away from the town and restaurants, the view of the harbor is an added bonus. Thanks Kevin, we look forward to returning.